DGF’s new Writers Alliance Grants demonstrate our enhanced efforts to get funds directly in the hands of writers while continuing a tradition of supporting nonprofit theaters with fair and equitable practices. Applications for the 2019 Writers Alliance Grants are closed. 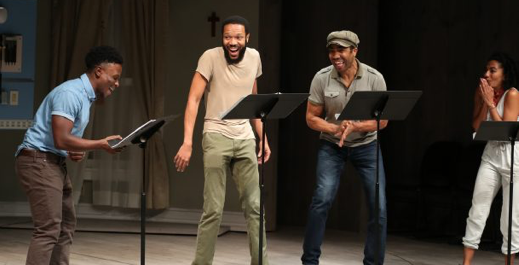 In addition to funding new work, DGF has partnered with the Dramatists Guild of America to change the national conversation about how writers are treated by the institutions that produce their work. Writers Alliance Grants are awarded both to nonprofit theaters and to writers in celebration of working relationships that align deeply with DGF core values. The writer is one whose work pushes boundaries and shows tremendous promise. The theater, which is either currently or slated to work with that writer, is one that holds itself to superlative ethical standards in supporting the livelihoods and careers of writers. Applicants will be scored on their contracts with writers and the artistic merit of the project for which they are requesting funding. Applicants will be scored on their contracts with writers and the artistic merit of the project for which they are requesting funding. Eligibility is restricted to producing organizations registered as 501(c)(3) nonprofits, not operating under a fiscal sponsor. Institutions must have a minimum of three years of production history. All funds given to theaters must go specifically toward the production expenses of the writer(s) they are producing, and applications must be specific to both the production and the writer(s). Applications will be judged on artistic merit and the quality of the contract with the writer(s) being produced. Contracts will be evaluated based on the Dramatists Bill of Rights, as outlined by the Dramatists Guild of America. Applicants will be provided the option to submit the contract they have drafted with the writer being produced or a signed contract Amendment from the Dramatists Guild of America, stating that their contracts are in keeping with all DG contract guidelines. The DG Contract Amendment reflects best practices in the industry culled from hundreds of theater contracts seen each year. To view the DG Contract Amendment, click here. For all questions regarding contracts or the DG Contract Amendment, please contact Associate Executive of Business Affairs at the Dramatists Guild of America, David Faux, at 212-398-9366. For all other questions regarding the Writers Alliance Grant application, please email info@dgf.org or call the Dramatists Guild Foundation at 212-391-8384. All awardees will be required to submit the executed contract for the project for which they received funding once it has been signed by all parties. If this contract is not found to be in keeping with all DG contract guidelines, their awards will be revoked. Recipients of the DGF Writers Alliance Grant will not be eligible to apply for five years following the year they are awarded.